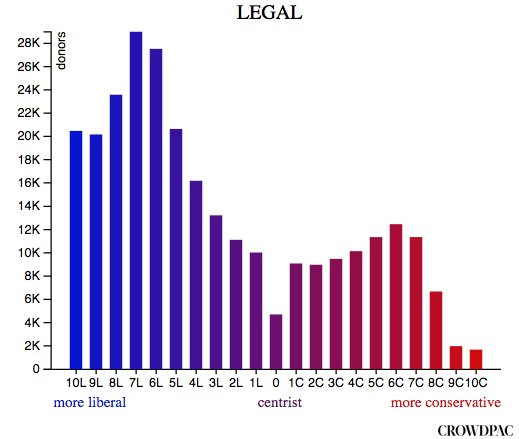 Crowdpac, a non-partisan firm dedicated to political data analysis, used federal campaign contribution records dating back to 1980 in order to estimate where various officials and donors fall on the political spectrum. 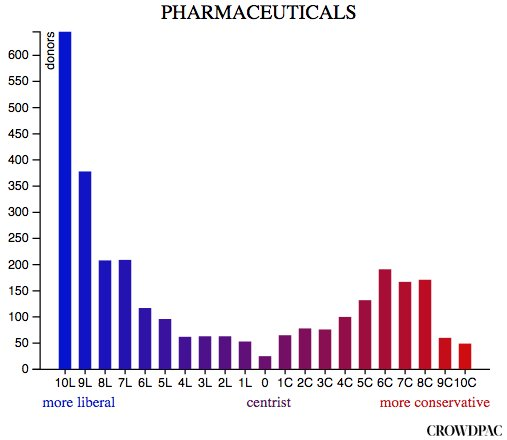 They scored individual donors as being more liberal or conservative based on what kinds of candidates they gave to. 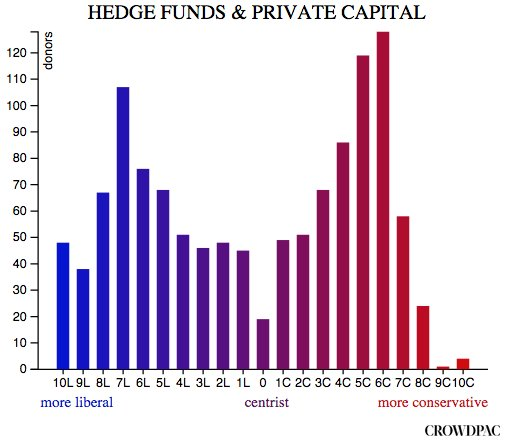 The company's CEO and co-founder, Steve Hilton, told Business Insider this donation data "is the heart of the Crowdpac data model" because their "research shows that campaign contributions are the best predictor of how a candidate will behave in office." Hilton also explained that the Crowdpac's main goal is to provide people "good objective, non-partisan information about the candidates on their ballot in a simple form that they can understand." 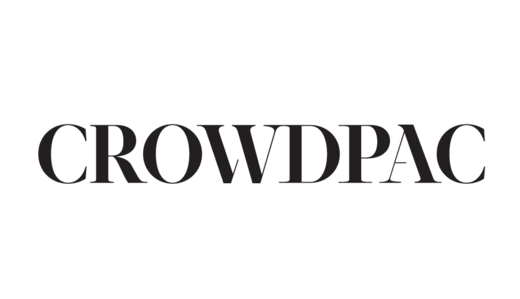 The company believes this will help "boost the number of small donors and reduce the influence of big money in politics." 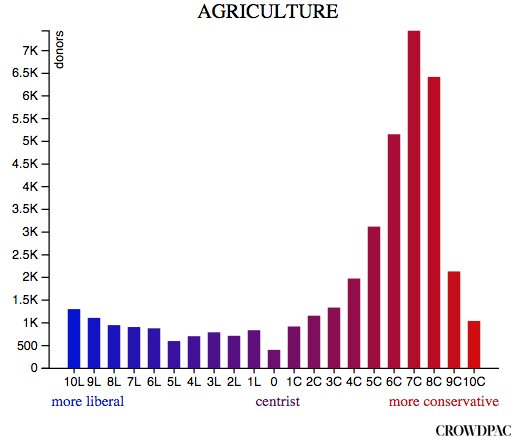 As part of their analysis, Crowdpac is also able to break down where various professions fall on the political spectrum. 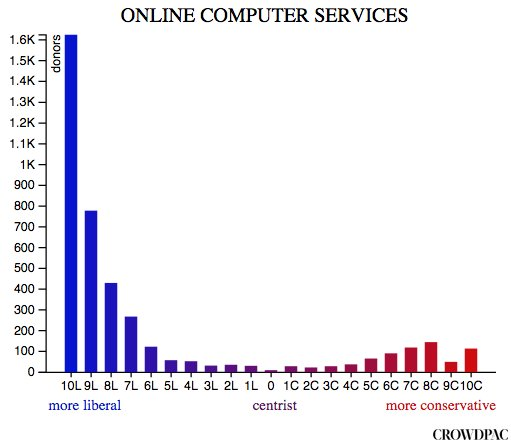 They provided that data to Business Insider. 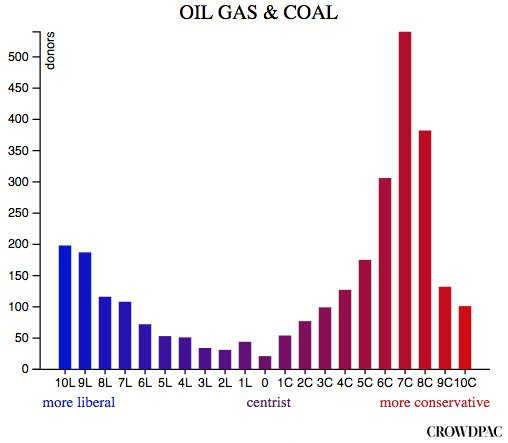 That basic summary shows the average ideology scores for each profession. 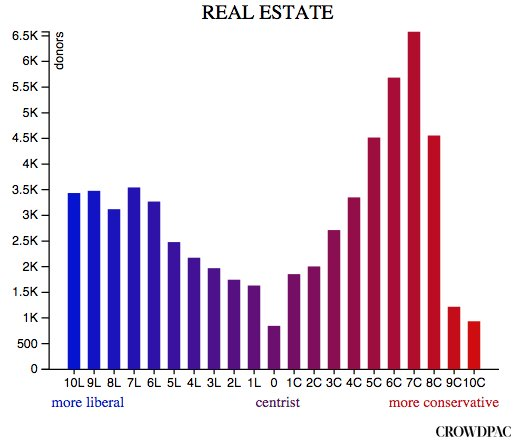 However, the "purple" professions that appear in the middle of the spectrum aren't really bipartisan. 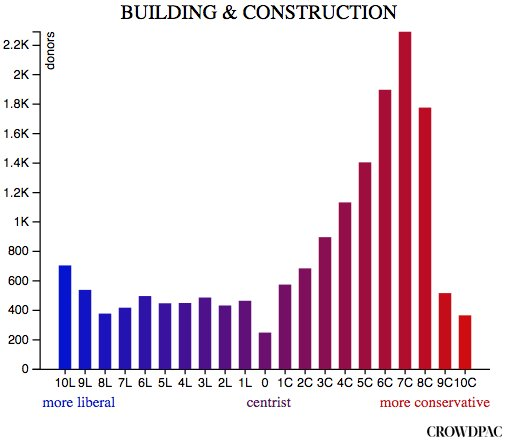 They're actually extremely polarized: Rather than having a large number of donors with middle of the road politics, they're largely split, with a big liberal group on one side and a similarly sized large conservative group on the other. 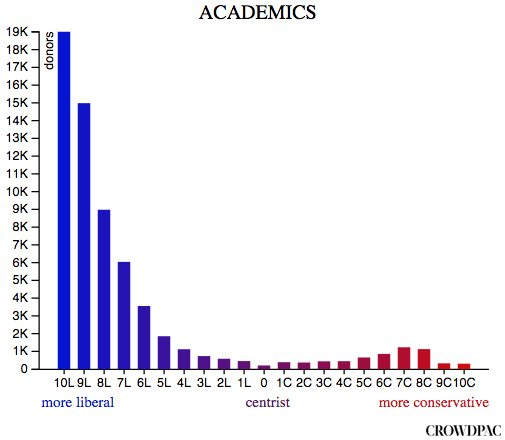 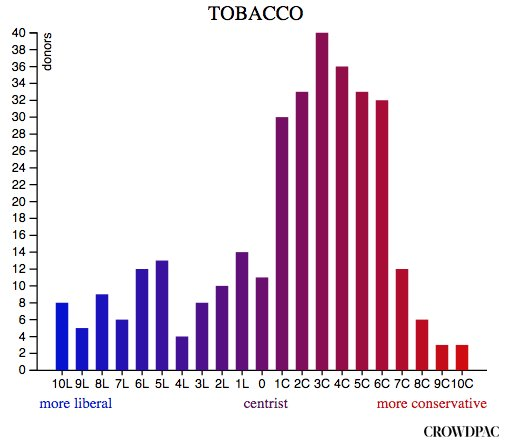 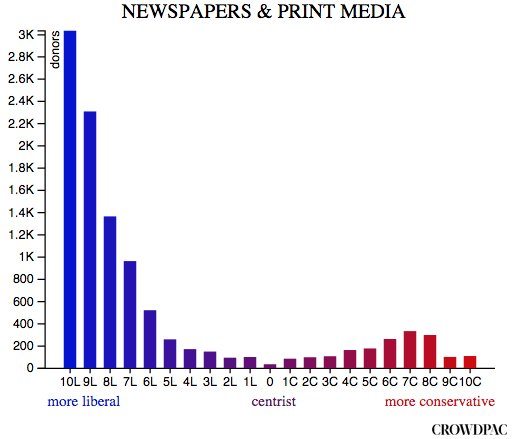 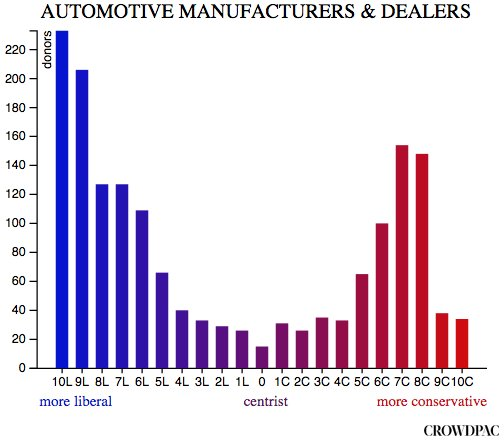 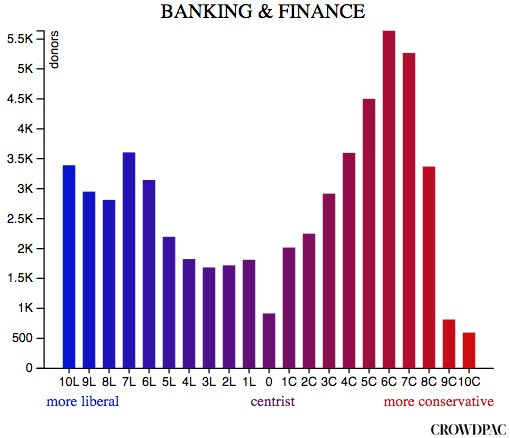 These divides can be seen in the following charts, which were provided to Business Insider by Crowdpac and show the number of donors with each ideology score in each profession. The rest of the industries reviewed by Crowdpac show a pattern of having a large number of donors from both ends of the political spectrum. 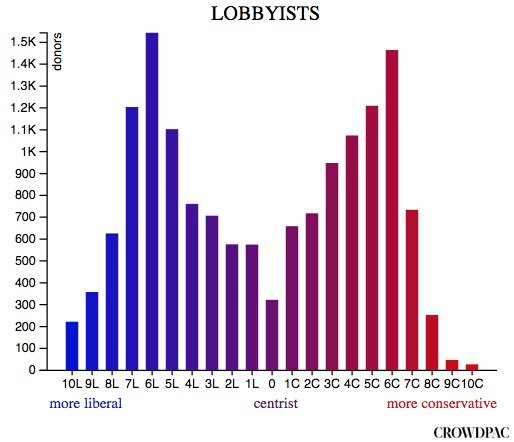 The only chart with symmetry is the one labeled LOBBYISTS. 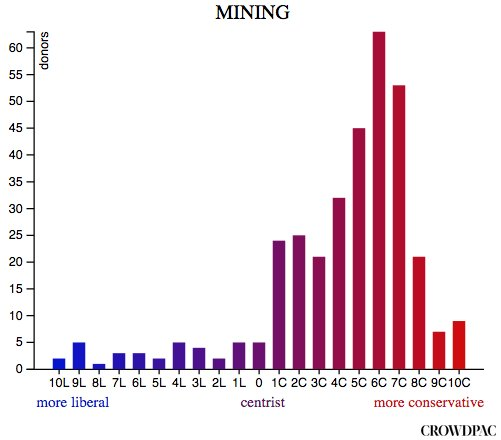 I knew mining would be right but I didn’t know we would be the farthest right.